One of my very first digital aerial photos from a flight over Iowa back in 2005. I believe it was taken with a 1.5mp Nikon hence the grain and weird colors. I recently saw a post on Atlas Obscura by an airline pilot who wrote a book about his job/life (I like the idea of a book-worthy occupation), and in the introduction he displayed window seat photos that were sent in to him by airline passengers. Having taken seemingly countless flights around the world, I too have amassed a large collection of window seat photos since first purchasing a digital camera back in 2004. I’ve always kind of considered these photographs to be a bit of a cliché, but I continue to shoot them anyways because the world looks very beautiful and foreign from way up there. Here is a collection of some of my favorites in chronological order from 2005 until just a few weeks ago. I hope that you enjoy them. Bula! Unlike the last few adventures to Iceland and the American West our most recent trip focused more on relaxation rather than activity. We decided early on in the planning process that we should go on a beach vacation, and we ended up choosing Fiji – Namale to be exact. If I were to go into detail about the people, the resort, the luxury, the phenomenal service, the amazing entertainment, and the fact that were one of just eight couples there at the time I am afraid this post would seem like a 2,000 word treatise on bragging. What I will say about Namale is this – do whatever it takes (sell the house/car/kids/farm) to get there and stay as long as you can. Blondie’s goal for the trip was to Relax and read and repair the damage that her high-stress gig causes and mine was to experience the beauty of the place and really look around rather than peer at everything through the viewfinder. Luckily for you I can only sit still and read, and snorkel, and drink for so long before I get the itch and head off somewhere to make some pictures. Here is but a small selection of photographs that I took during our travels to and stay in Fiji. I may post a few more in the future because there were a lot of good ones. Please click any photo to see its full-sized version. The urban sprawl of the LA area is remarkable at night. 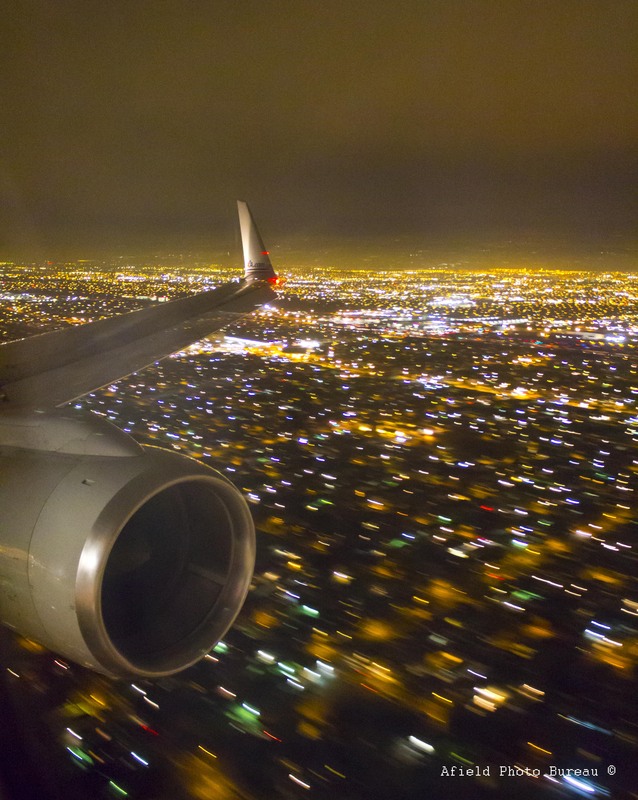 Here we are just about to land at LAX before our long flight across the pacific.